Palak kadhi is a healthier type of kadhi since we are adding palak instead of fried pakoras (fritters) as in kadhi pakora. 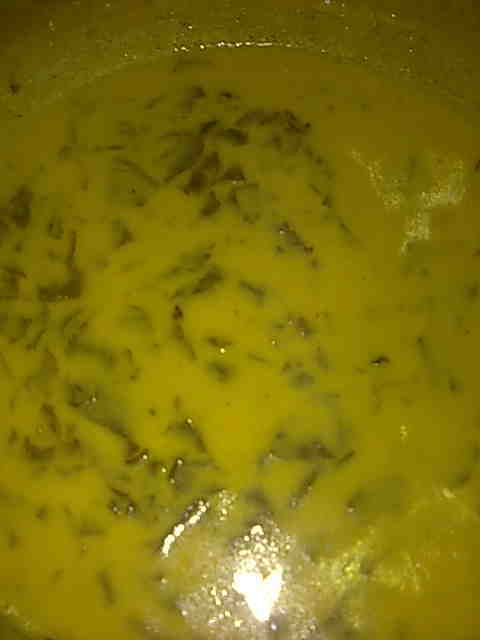 Palak kadhi or spinach kadhi is made both in Rajasthan and Punjab. Spinach in yogurt and chickpea flour sauce makes for a satisfying meal with plain boiled rice. 1. Mix together curds, besan, salt, red chilli powder, turmeric powder and water. Mix well using a blender. 2. Heat oil in a kadhai/ wok. Add cumin seeds and methi dana. When they change color, add hing. 3. Add curd besan mixture. Cook stirring till it comes to boil. 4. Lower heat and add chopped palak. Simmer on a medium-low heat, uncovered for about 25 minutes. Stir occasionally. 5. If it is too thick, add 1 cup of water and boil again. Serve hot palak kadhi with roti or rice.